100_0507, a photo by constantiak on Flickr.
. . . but squee! I had donated this piece for the Knowne World Auction (that took place at Pennsic this year, and I got the results of how much this collar raised. Half of the proceeds went to my kingdom, or to the artisan’s indicated kingdom, which in my case was Calontir, and the other half of the monies raised went to the SCA as a whole. This collar raised $100. My Laurel pointed out that as a relatively unknown artist in the SCA, this is fantastic. (and for me, it’s not far from what I would probably charge someone commissioning me to make something similar.) I was also told that the collar “was lifted up and the assembled crowd went ‘ahhhhhhhhhhh'”, and that, as an artisan, makes me feel awesome. 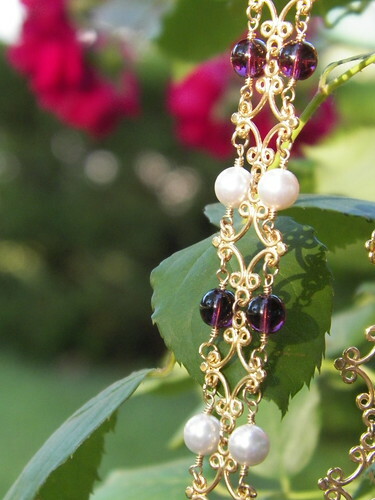 For those of you wondering about the materials I used: gold-plated brass links, Swarovski pearls, and Czech Druk beads, in addition to 4mm jumprings and permanently coloured copper wire. Not seen is a chain on the back and the clasp, which is also gold-plated brass. I’m fairly sure the construction isn’t entirely period, but it does look very much like similar pieces seen in later period paintings. So, thank you, mystery buyer, whoever you are! Not only for helping the SCA, but also for making me feel awesome. This entry was posted in collar, collar of estate, jewellery, jewelry, later period and tagged 1400s, bead, beads, brag page, calontir, collar of estate, jewellery, jewelry, Pennsic, SCA, society for creative anachronism, wire. Bookmark the permalink. 5 Responses to You’ll have to pardon me . . .
Hi there! The process I used for this collar is similar to a much simpler piece, actually. Take a look at this tutorial, and let me know if that helps any. (there are a couple of differences, as I used links in addition to beads, but the process of connecting is the same. I did, however, use jumprings on that piece, whereas I rarely use jumprings now unless I absolutely have to. Experiment, and try things out, and most importantly, let me know how your piece goes! Thank you for your help with this. I finally got round to braving the piece and wore my completed collar with my banquet garb at a recent event with my character. It’s a little longer than I think it should be as I couldn’t get it to sit right, but the main thing is I made it and am grateful for the help and inspiration you provided. So thank you again! I’m so glad it turned out well for you! You’ll have to show me your photos! In about 30 mins there should be a few photos up on my website with other bits of my knight’s fancy stuff.